Apple’s Spring Forward event has concluded and a lot of things were announced. The biggest announcement was the all new MacBook. As rumored, Apple unveiled a 12-inch MacBook with Retina display, an edge-to-edge keyboard and a Force Touch TrackPad clad in Gold, Space Black or Silver. CEO Tim Cook said that they wanted to reinvent the Notebook and thus came up with all new MacBook. Yes, it’s called MacBook. No Pro, no Air or anything. The new MacBook has a 12-inch Retina display that has a resolution of 2304-by-1440 pixels. The Retina display is just 0.88 millimeter thick and Apple has used an edge-to-edge glass, 0.5 millimeter thick, to cover the display. 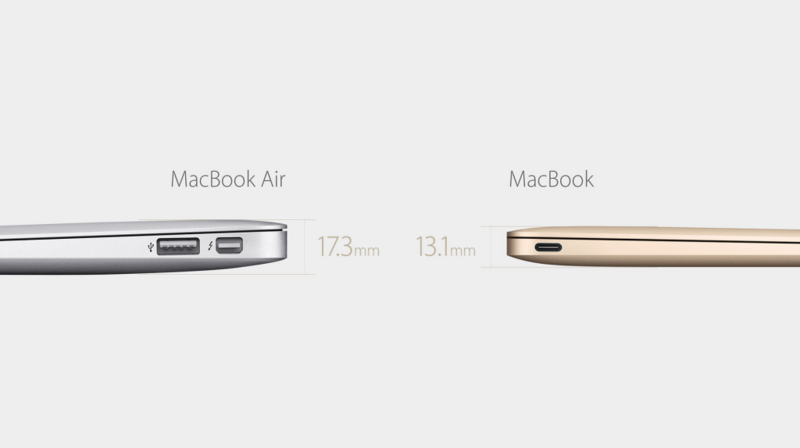 Overall, the new MacBook is only 13.1 mm thin at its thickest point. In comparison to the MacBook Air, which is 17.3 mm at its thickest point, the new MacBook is about 24 percent thinner. The new MacBook weighs only 2 pounds, which is super light. To get so thin and light, Apple had to let go of a lot of things. For example, the new MacBook has a fanless design, which means that the logic board is around 67 percent smaller than before. Fanless design also means that the MacBook will be super silent. On top of that, Apple has used Intel’s latest 5th Gen Core M “Broadwell” processor, which uses only 5 watts of power. This also meant that Apple could add more battery to the notebook. However, Apple has used a terraced battery placement to save more space. Thanks to the terraced arrangement, the new MacBook houses 35 percent more battery cells and can provide up to 9 hours of browsing and 10 hours of video playback. Now let’s talk about the main features of the 12-inch MacBook. Firstly, Apple has improved the keyboard with an edge-to-edge design and a new butterfly mechanism for the keys. The MacBook still features a full keyboard and large keys so it’s easier to type. The keyboard is 40 percent thinner than before and the keys are 17 percent larger. The Butterfly mechanism uses a single assembly made from a stiffer material, which allows for a more precise keystroke. Apple states that this new mechanism improves stability, uniformity, and control when typing. The keyboard now features individual LEDs for every key, which provides better and sharper backlighting. Next up, the Force Touch Trackpad. Apple has borrowed the Force Touch feature from the Watch and brought it to the MacBook. 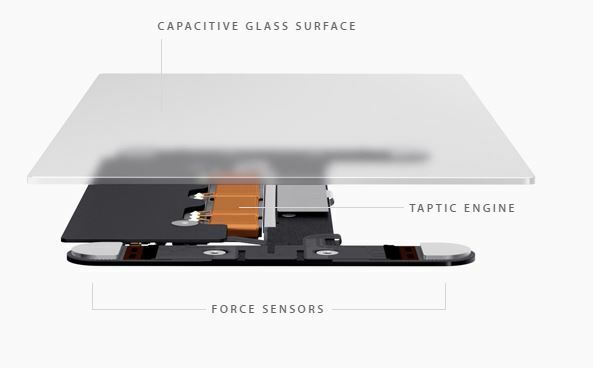 The new Force Touch TrackPad has a capacitive glass surface, four Force Sensors at the corners and the Taptic Engine. There are no buttons on the trackpad, but it can tell the difference between a tap, a click and a press. You can customize the pressure sensitivity on the trackpad to perform different actions. For example, you can increase pressure on the trackpad and that will forward a video faster. The Taptic Engine provides haptic feedback so you can also feel what you’re doing on the screen. Lastly, as reported earlier, Apple has indeed gotten rid of all the standard ports and included an all new USB-C port. This port offers charging, USB 3 data transfers, and video output that supports HDMI, VGA, and Mini DisplayPort connections. All this from one single port. 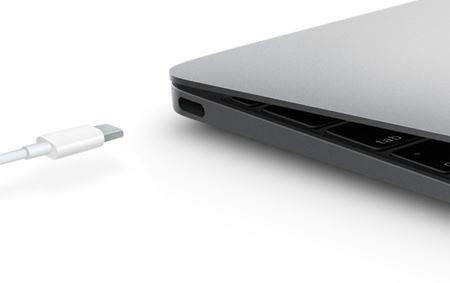 You are, however, going to need a bunch of adapters to use the new USB Type-C port. Now, the technical specifications. You can opt for an Intel Core M dual-core 1.1 GHz processor coupled Intel HD Graphics 5300, 8 GB of DDR3 RAM and 256GB of storage. There’s also an Intel Core M dual-core 1.2 GHz processor variant that comes with 512GB of storage. Both the models can be configured with an Intel Core M dual-core 1.3 GHz processor. The 1.1GHz variant will cost you $1,299, whereas the 1.2GHz model costs $1,599. 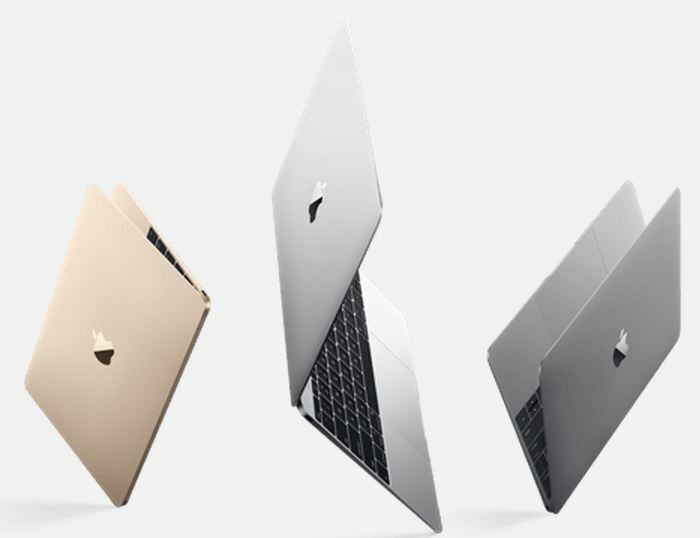 The new MacBook is available in Gold, Space Black and Silver. What do you think of the new MacBook? Will you be buying one? I’ll buy anything if it’s shiny and made by Apple.